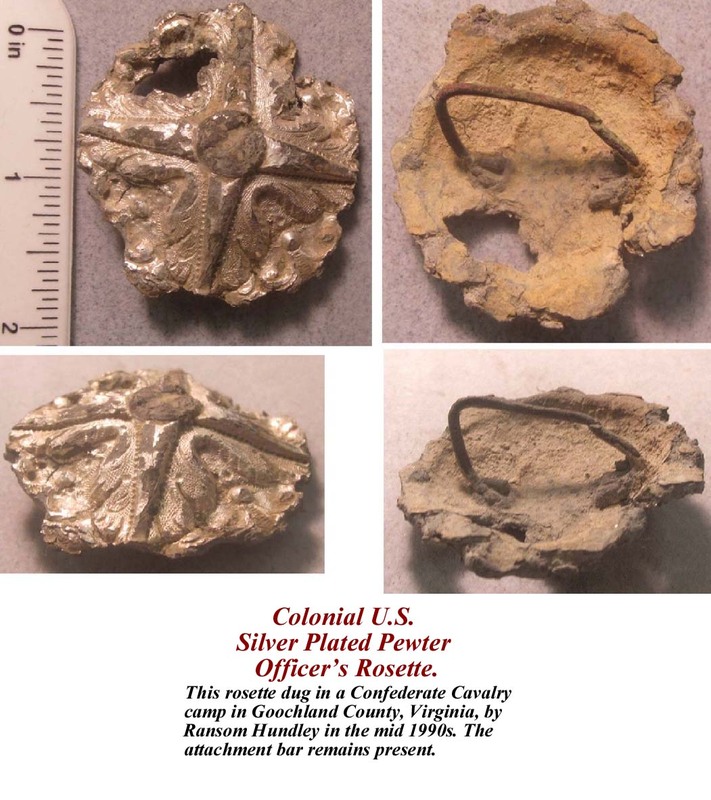 Colonial U.S. Silver Plated Pewter Officer's Rosette. 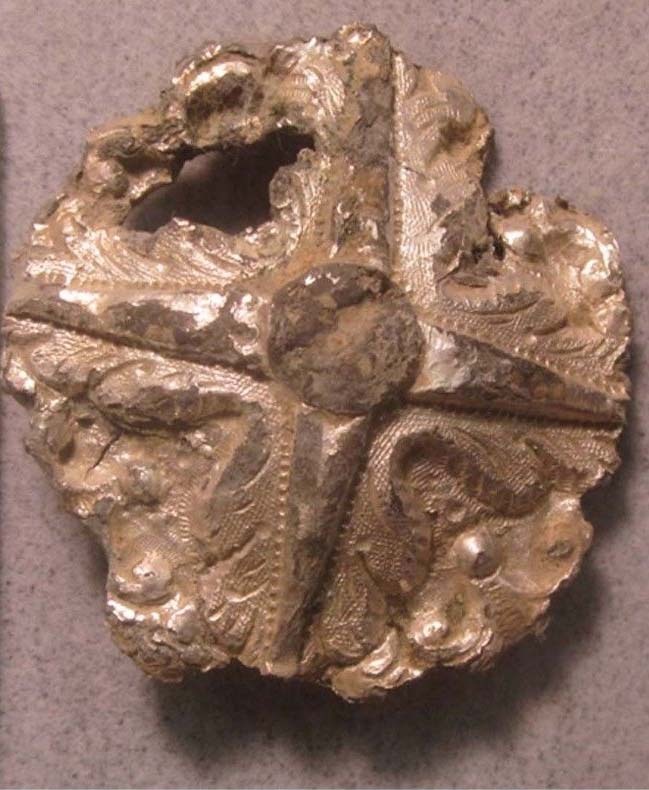 This rosette dug in a Confederate Cavalry camp in Goochland County, Virginia, by Ransom Hundley in the mid 1990s. The attachment bar remains present. 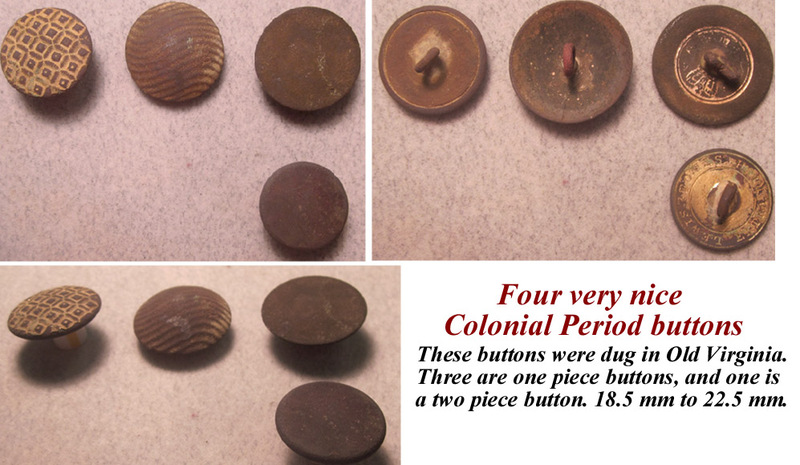 Four Colonial buttons dug in Old Virginia. 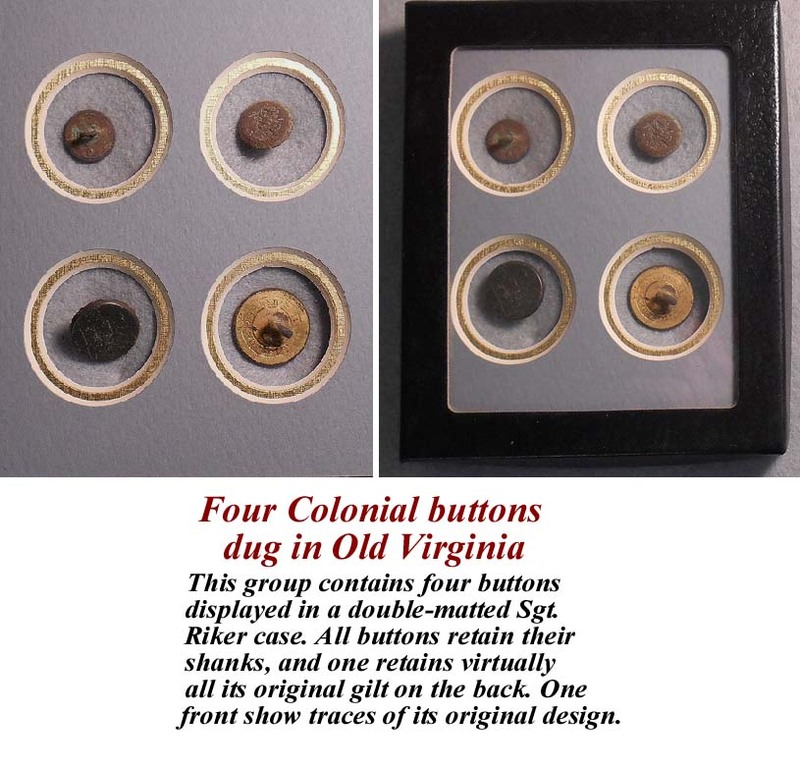 This group contains four buttons displayed in a double-matted Sgt.Riker case. 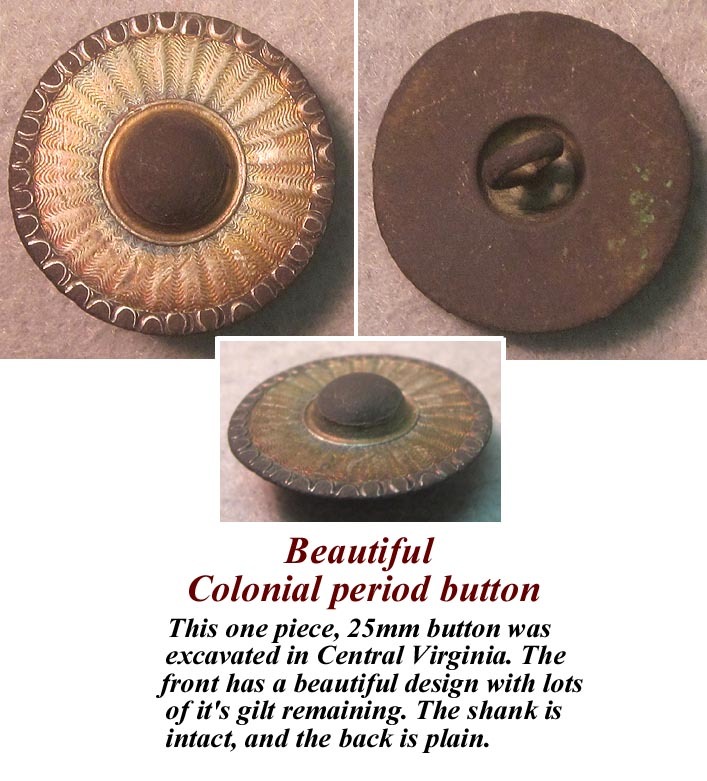 All buttons retain their shanks, and one retains virtually all its original gilt on the back. One front show traces of its original design. 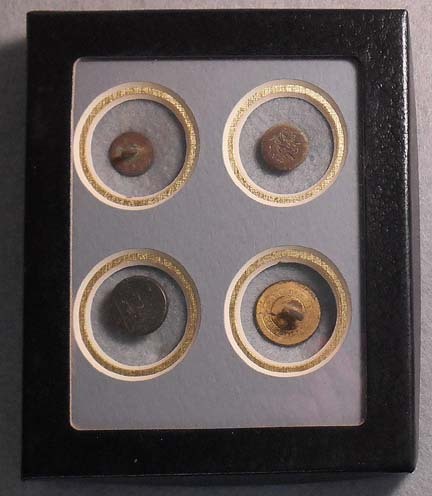 Seven large Colonial period buttons. 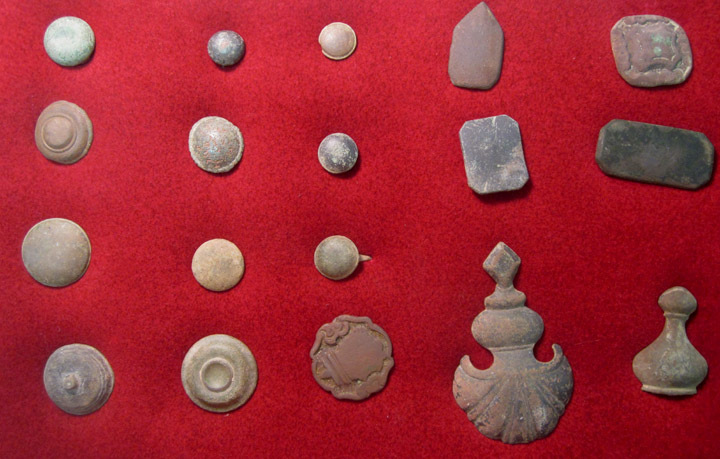 These buttons were recovered in the Richmond, Virginia area. They measure 27-29mm in diameter and are in wonderful dug condition. All retain their shanks. 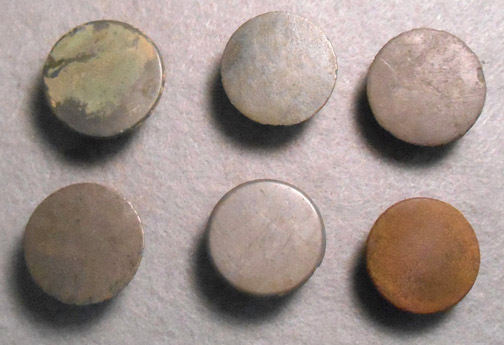 Six are pewter buttons, and the other appears to be brass. 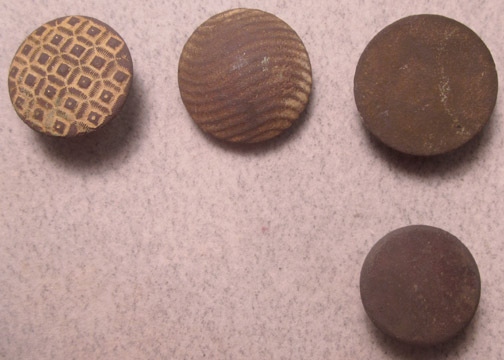 Four very nice Colonial Period buttons. 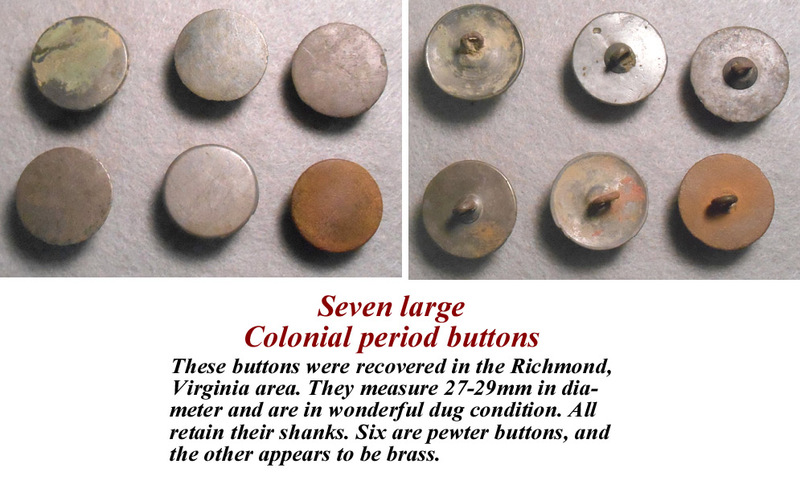 These buttons were dug in Old Virginia. Three are one piece buttons, and one is a two piece button. 18.5mm to 22.5mm. (18) Harness Rosettes and Bosses. Large Colonial period Pewter spoon. 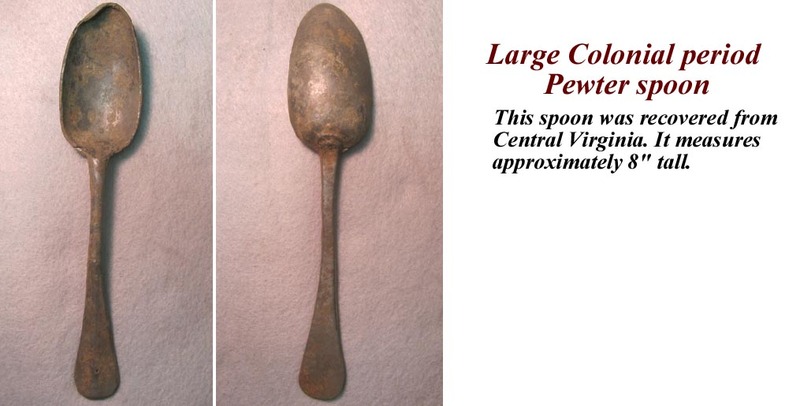 This spoon was recovered from Central Virginia. It measures approximately 8" tall. 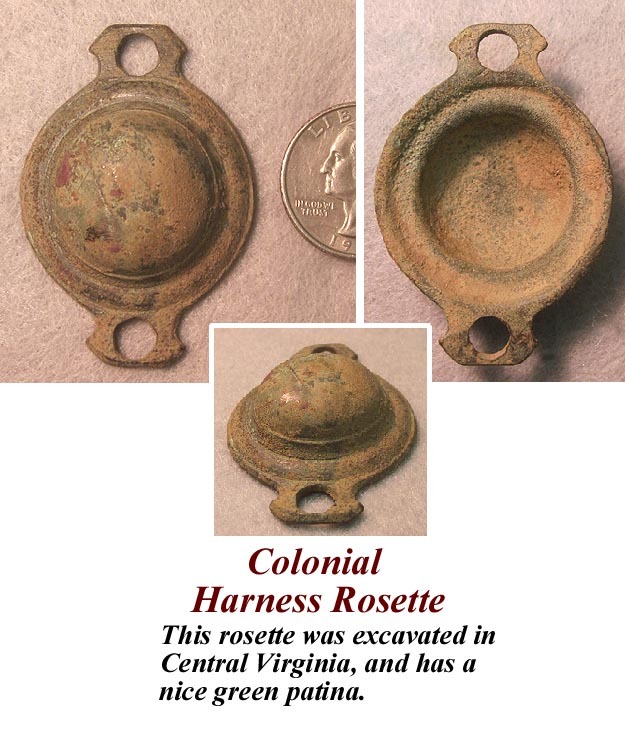 This one piece, 25mm button was excavated in Central Virginia. shank is intact, and the back is plain. (20) Colonial period clay marbles. 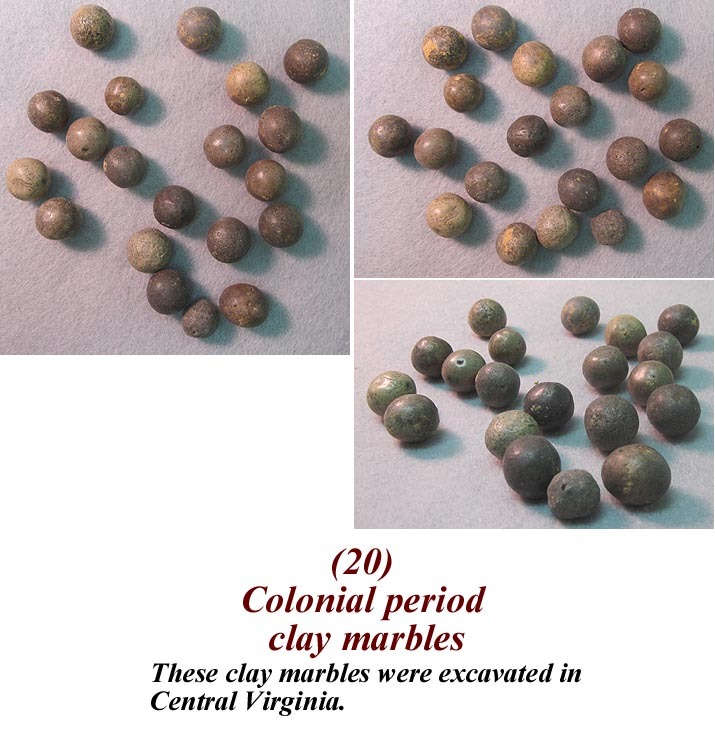 These clay marbles were excavated in Central Virginia. and has a nice green patina. 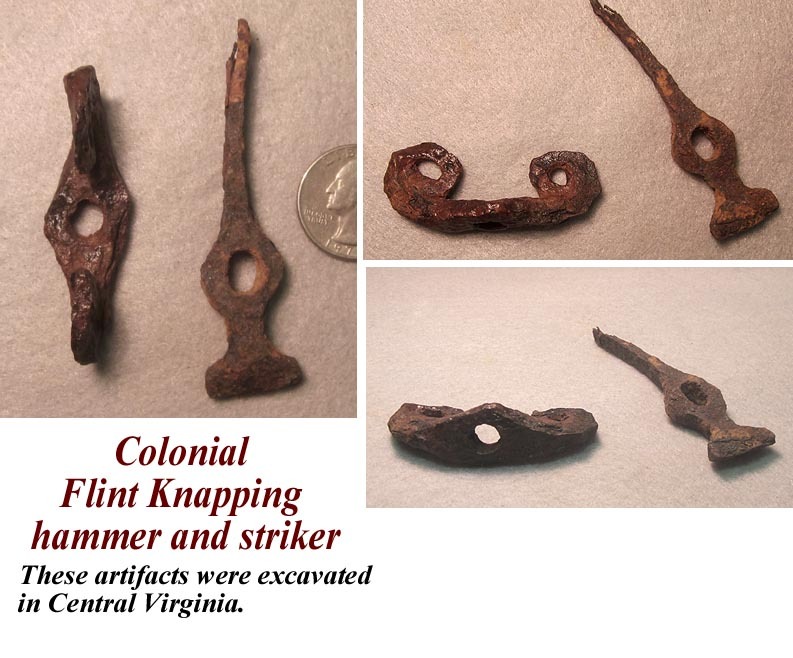 Colonial Flint Knapping hammer and striker. been sprayed with clear acrylic for preservation.